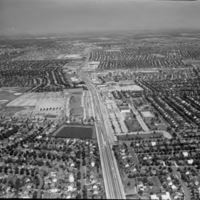 Aerial view of Levittown looking East with Hempstead Turnpike running down center of photo. Division Ave. running off to left center. “Aerial view of Levittown, NY,” Hofstra University Library Special Collections: Digital Collections, accessed April 23, 2019, https://omeka.hofstra.edu/items/show/3368.